This beautiful bedroom designed by Carole Weaks totally blew me away! A palette of pale yellows and soft whites definitely creates that calming and relaxing feel. A decorative pillow, a bench and curtain panels use the same floral chartreuse fabric to unify the room. In addition, the pretty textiles also provide charm and visual interest to the space. 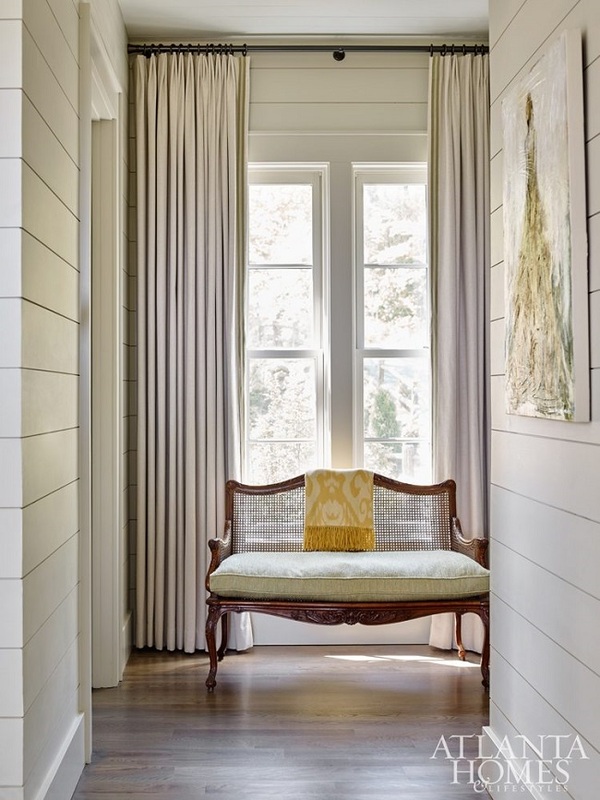 On the other hand, the shiplap walls bring a casual note to the room. A round mirror above the bed mimics the curved lines of the graceful headboard, thus creating a repetition and a pleasing aesthetic. Understated, elegant and inviting, what's not to love about this timelessly gorgeous bedroom? Your thoughts? Beautiful bedroom. Just enough color. Very restful!